Considering the very different impressions that vision and smell make on us, there are surprising similarities in how the two senses are processed before they reach the brain. And it is quite possible that these similarities may throw some light on how we describe the aromas we find in wine. The olfactory bulb (we actually have two of them) is an elongated protuberance lying close to the underside of the brain, but attached only at the back end. 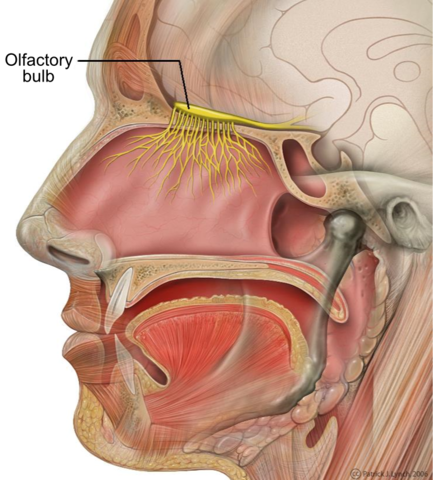 The surface of the human olfactory bulb has on it some 6,000 spherical bundles of cells called glomeruli, each one being connected by neurons to several thousand olfactory receptors in the nasal cavity. When odorous compounds enter the nasal cavity, each glomerulus is activated to a greater or lesser extent, creating a pattern of activity on the surface of the olfactory bulb that is a representation of the odours detected. That pattern can be regarded as analogous to the pattern of activity on the retina of the eye when an image falls on it. In fact the similarity does not stop there, because just as the image on the retina is further processed to facilitate detecting edges and motion, the activity pattern in the glomeruli is also enhanced by subsequent layers of cells in the olfactory bulb. 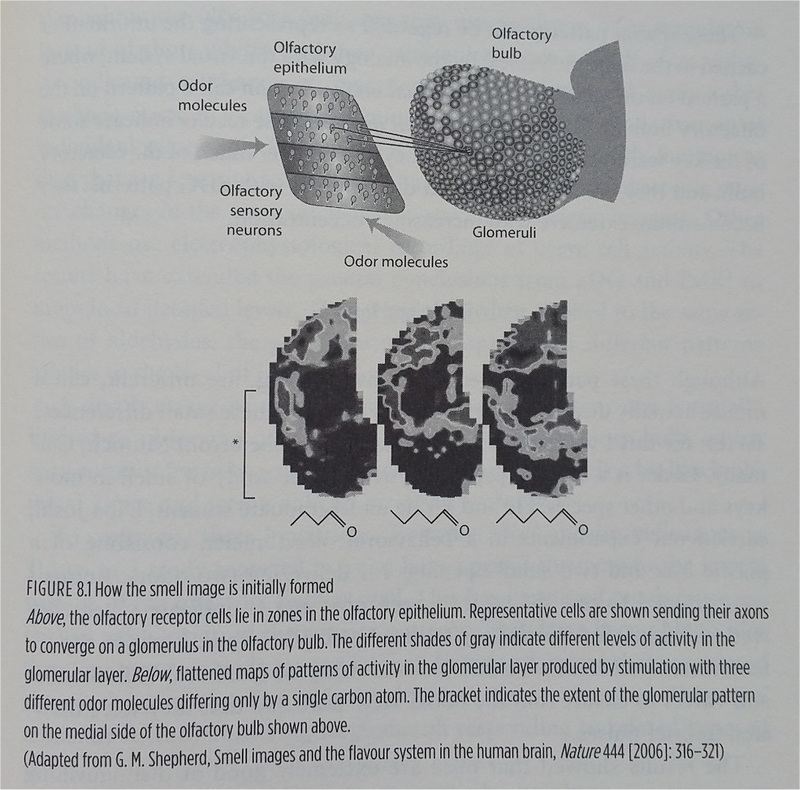 Examples of smell images, reproduced from Gordon M Shepherd’s book Neurogastronomy (reviewed here), can be seen below – click to enlarge and make the text legible. In the same book, Shepherd proceeds to speculate that the smell images created by glomeruli activity are similar to visual images of faces. He suggests that this explains why smells, like faces, are difficult to describe in words but relatively easy to recognise. As a result, if asked to describe a smell we need to resort to comparisons with the smells of well-known objects. Also, neither smells nor faces are processed as the sum of distinctive component parts – we tend to recognise both of them holistically, not so much by the detail as by a general impression, and the relation between the parts of the image. Only occasionally can we recognise a face if we only see a small part of it, and usually only for faces we are very familiar with. This speculation of Shepherd’s can be plausibly taken even further, and related to how we recognise and describe wines. Regardless of whether we are nosing a complex wine or sniffing a single chemical compound, at one level in our perceptual system the result is a glomeruli smell image. I would propose that, in the case of wine, certain aspects of that smell image may remind us of the smell images of other objects – blackcurrant maybe, or lemon – which then become the descriptors we use for the wine. In some cases, the aspects of the smell image that cause us to identify other objects in wine may arise from chemical compounds in common, but this need not necessarily be the case and similarities might be coincidental. The aspects in common may be as simple as discrete fragments of the smell image, or possibly with their root in common relationships between different parts of each image. To continue with the face analogy, the identifying of blackcurrant in a wine could be like saying that a baby’s face has his grandfather’s eyes – the eyes need not be identical, but there is however something that seems somehow similar, perhaps the relationship between the eyes and the nose. Something else that has a counterpart in wine is the idea that if we are very familiar with a face is it easier to recognise it from a partial image. In a smell image of wine, presumably the types of fruit etc. we may recognise in it are only partially represented, and that could explain why it we are more likely to recognise the aromas we are more familiar with, either from the experience of the actual fruits or from other wines. I totally accept that most of this is speculation on the part of Shepherd and me, but nevertheless I think how we experience and describe wines is consistent with the idea of smell image recognition, and an interesting way of conceptualising it. Only time and more research will be able to refute or support these ideas. This entry was posted in Tasting and taste and tagged aroma, perception, science, smell, tasting. Bookmark the permalink.